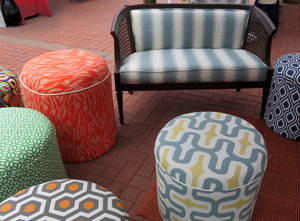 Contemporary and upcycled furniture from Jamie Lauren Upholstery awaited customers at Boulder’s Firefly Handmade Market in summer of 2014. Last spring at an art festival in Boulder, a middle-aged couple wandered among the brightly upholstered antiques, ottomans, and benches at Jamie Solveson’s booth. “Jamie Lauren Upholstery” read the sign on the tent. The couple slipped quietly away to the next booth, but Jamie received a call from them weeks later. They had an 80-year-old chair that had been brought outside for a patio party and had subsequently been rained on, they told Jamie. Because it was wet, it had remained outside. There was more rain, and more time passed for the chair on the patio. Squirrels took advantage of the situation and pulled out the stuffing until the back and seat were thoroughly tattered from one side to the other. That day at the festival, the couple had been impressed with the quality and artistry of Jamie’s work. They told her they would like to donate the chair to her in the name of art. Jamie agreed to take it. 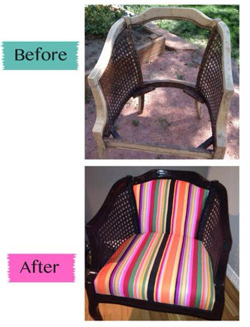 She took the chair apart, sanded the wood, and restained it. 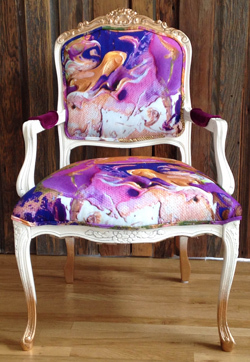 Then she reconstructed the chair, covered it in a bright, contemporary fabric, and displayed it at a gallery event. The chair enchanted one of the visitors. The delighted lady bought it, loaded it into her SUV, and took it home – all the way to Montana. The anecdote is one of Jamie’s favorites. To see an old piece of furniture on its way to a new life brings her great pleasure. 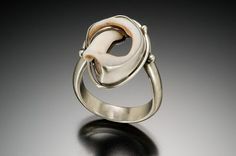 Each piece has its own personality, she told me, and a story to tell. She loves giving it a chance for another story. Over three years ago, juggling the responsibilities of a corporate job and a new baby, Jamie was looking for a way to have time for herself doing something just for her. Learning how to upholster sounded good, even though she had minimal experience sewing and didn’t have anything in mind to reupholster. She found an opportunity to take a class one evening a week. A friend provided her with an old chair to work on as her first project. Jamie quickly discovered that she had a knack for the craft. Her first project is pictured at right. Jamie began to look on craigslist for interesting furniture to upcycle with contemporary upholstery. Friends found out about her new interest and kept an eye out for more. Eventually she taught herself to make ottomans – not just to upholster them, but also to build the wood structure beneath the padding and fabric. 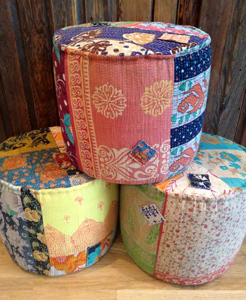 Old wicker ottomans that her children had torn apart gave her an idea of how to start. 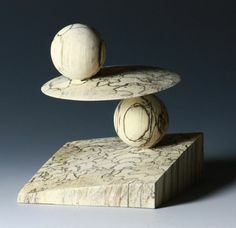 At first she worked with plywood and 2 x 4s; later she added bendable poplar to her design. 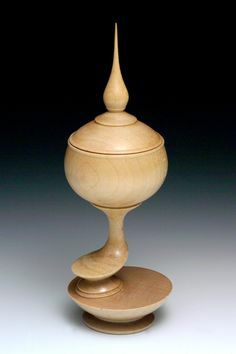 Bendable poplar isn’t easy to find, nor is it cheap, Jamie told me; but it gives the circumference of her ottomans a more solid, hefty feel. Jamie discovered a demand for her bright, contemporary work. She quit her corporate job and started Jamie Lauren Upholstery a year ago. (Lauren is her middle name.) Now she fabricates, upcycles, upholsters, and markets her furniture 20 hours a week while her children are in school. She still searches craigslist for furniture that deserves another chance at life. Occasionally she checks thrift stores and garage sales. She studies the quality, condition, and history of any visible wood before she decides how to restore it. 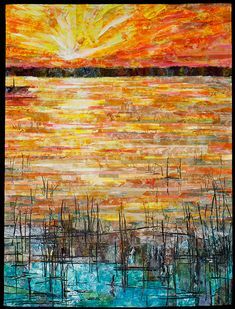 Applying oil, stain, or paint, are all possibilities she considers. Now that she has a business license, Jamie enjoys ordering designer upholstery by the yard at wholesale prices. 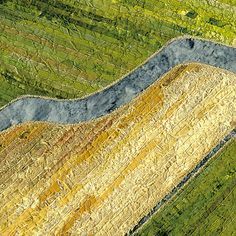 Her favorite line of fabrics is Robert Allen for its colors, designs, and quality. Colorful upholstered benches have become part of the Jamie Lauren line. Just as she had taught herself to make ottomans, Jamie taught herself to build the underlying structure for a bench. Trendy hairpin legs, prefabricated from metal, are frequently an element of her design. Burlap embellished with needlepoint covered this family heirloom when its owner brought it to Jamie Solveson. Jamie accepts custom work with caution. “I’m not an upholsterer,” Jamie told me. “If someone wants me to reupholster dining room chairs with brown velvet, I’d have to say no.” If a customer wants to give a piece of furniture a new life with artful flair, on the other hand, Jamie responds with enthusiasm. She likes to see pictures of where a piece is going to be placed so she can recommend choices of fabric that will enhance not only the furniture but the entire room. 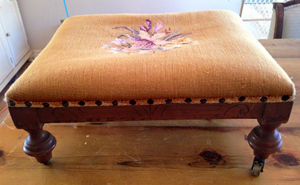 Recently she agreed to revitalize the footstool pictured above. It was a family heirloom covered with burlap, the material she would have expected to hold coffee beans or flour long ago. She carefully removed it and returned it to her customer. 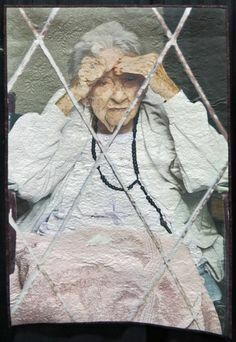 Not only did she want to preserve for the owner the needlepoint that decorated this heirloom, but she also felt reverence for the ancestors who had used whatever they had and made the best of it. 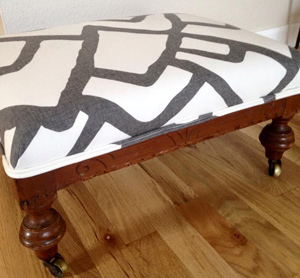 When she was finished, the footstool had taken on the look of Jamie Lauren furniture with its tribute to two eras. Jamie keeps her fans up-to-date on her projects on Facebook. Scrolling through her posts at Jamie Lauren Upholstery Upcycle is a great way to find out what she tackles and how she does it. It’s also a great way to find out what is the latest piece for sale. A few months will pass before Jamie sells her furniture at art festivals. Her favorite festival is Denver’s Sweet William Market, held the last Saturday of the month, May through September. There’s plenty of space to spread out her furniture in a large park-like setting, she told me, and the festival draws a crowd that’s in tune with her style. Don’t worry – you’ll get a reminder here on Handmade on the Front Range. In the meantime, her ottomans await customers at Nod & Rose and Island Farm in Boulder, where Jamie lives and works. 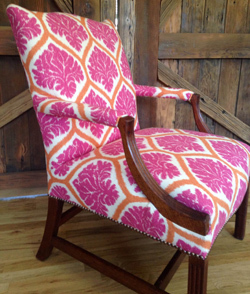 Also in Boulder is Fabricate, a fabric boutique where Jamie will give her first class in upholstering an ottoman on February 15. Browse the Jamie Lauren Upholstery website to see more of the furniture that took on a new life story in Jamie’s hands. 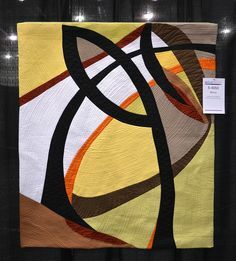 This entry was posted in Fabric & Fiber, Wood and tagged furniture, ottomans, upholstery on February 4, 2015 by Sally.